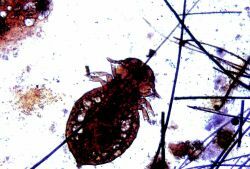 A genus of biting lice that includes the species Trichodectes canis (Trichodectes latus), the biting louse of dogs that commonly serves as an intermediate host for the dog tapeworm, Dipylidium caninum, as well as the species Trichodectes climax (Bovicola caprae), Trichodectes parumpilosus (B. equi), Trichodectes scalaris (B. bovis), and Trichodectes sphaerocephalus (B. ovis). A genus of lice that infests dogs and sheep. Some are the intermediate hosts of tapeworms. a genus of biting lice in the subfamily of Ischnocera. found on zebra and wild equids. found on wild black bear. Osborn (1896) previously reported it (as Trichodectes mephiditis) from Nebraska (Holt County) from M.
cattle, horses, sheep, and goat species), Trichodectes canis (dog louse), and Felicola subrostratus (cat louse).